Most of Manhattan's nearly 1,000 churches are faithful to the sanctioned look for a house of worship--but not the Greater Refuge Temple. Designed in 1966 by Costas Machlouzarides, it proudly preens at 2081 Adam Clayton Powell, Jr. Boulevard. 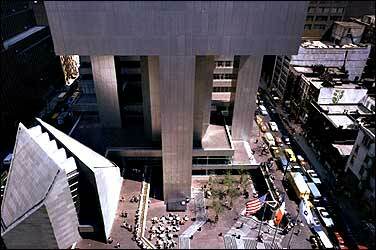 246 East 15th Street: Designed in 1966 by Brother Cajetan J. B. Baumann (yes, a priest-slash-architect), the arched façade of St. Mary's Catholic Church of the Byzantine Rite enfolds . . .
. . . a kaleidoscopic interior of triple-height stained glass. 619 Lexington Avenue: Watched over by the the Citigroup Center, Manhattan's seventh tallest skyscraper, is St. Peter's Church, the edifice on the bottom left designed in 1977 by Hugh Stubbins & Associates. Some say the design evokes two hands in prayer; others, a majestic rock that affirms the deity's presence in the heart of the city. An organ constructed by Johannes Kalis Orgelbau of Bonn dominates the sanctuary at St. Peter's. The red-oak case is 18 feet square and stands 10 feet above the floor. The needlepoint pew cushions were designed by Massimo and Lella Vignelli, who also designed the iconic signage for the New York City Subway. Part of St. Peter's is the intimate 28-by-21-foot Erol Beker Chapel of the Good Shepherd, a sculptural environment by Louise Nevelson. 815 Second Avenue: On the ground floor of a humdrum building housing the Episcopal Church Center is the Chapel of Christ the Lord, dating from 1961 and designed by Adams & Woodbridge. Gabriel Loire of Chartres created the nonrepresentational stained-glass windows. 373 Second Avenue: Church of the Epiphany by Belfatto & Pavarini. 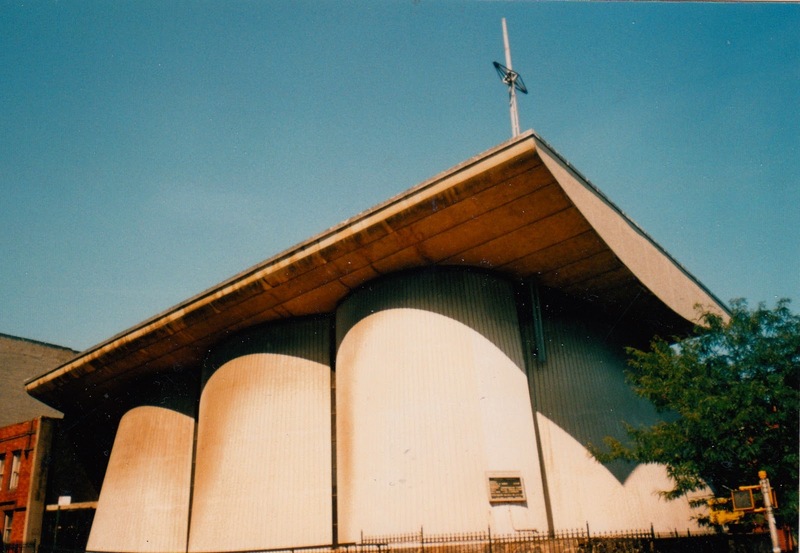 The sanctuary remains true to the day it opened in 1967. 777 First Avenue: The façade of the Tillman Chapel of 1963 displays a sculpture by Benoit Gilsoul entitled Man's Search for Peace. The center of this arresting composition shows the all-knowing eye of the Almighty. The divine eyeball is more obvious inside, where the stained-glass window by Henry Lee Willet can better be appreciated. 315 East 47th Street: The Church of the Holy Family--with its blind façade embossed with Greek crosses--was designed in 1965 by George J. Sole. The ceiling of the narthex (or church lobby) has nifty fixtures. 459 West 149th Street: The Church of the Crucifixion of 1967 by Costas Machlouzarides. Note the way the cross pierces the aerodynamic roof like an hors d'oeuvre pick. 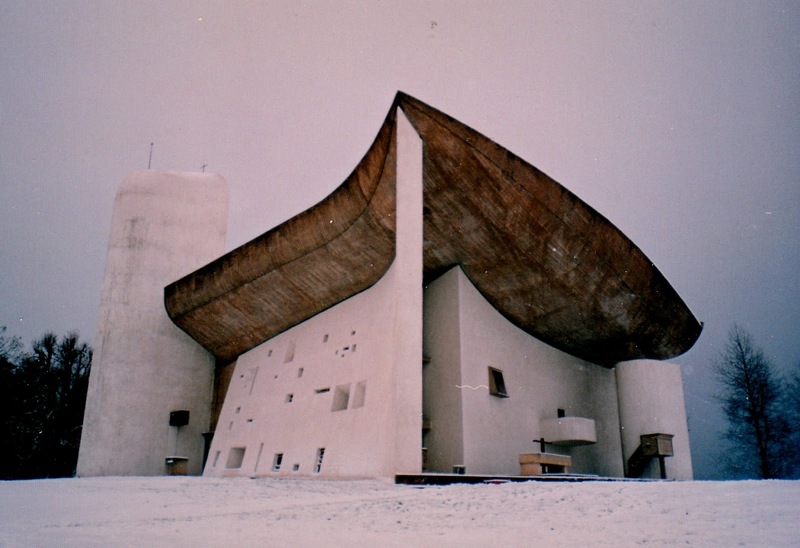 ﻿Oft noted is how the Church of the Crucifixion calls to mind Le Corbusier's Notre-Dame-du-Haut de Ronchamp of 1954. 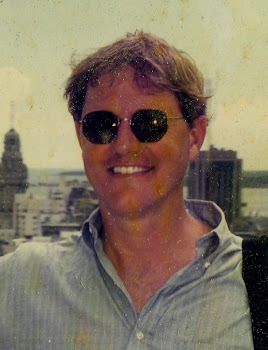 I took this picture on November 25, 2005.